ContinuitySA has been working on a mobile application for business continuity and resilience, says Padma Naidoo, GM: Advisory Services at ContinuitySA. We live in a digital age, and the use of technology pervades every aspect of our lives. The world, particularly the business world, has grown an integral reliance on digital platforms, and access to accurate information at one's fingertips. With a few diminishing facets of business not seeking to leverage the use of digital technology, the expectations placed on organisations have increased exponentially, not just as part of day-to-day operations, but also during crisis situations. Forget the luxury of having time to prepare a well-structured media release, executives sometimes only learn of a crisis in their organisation once it's gone viral on social media. Thus, it's about time business continuity practitioners elevate an organisation's response to disasters in light of emerging expectations, says Padma Naidoo, General Manager: Advisory Services at ContinuitySA. "Competitive business landscapes have urged businesses to adopt just-in-time supply chain principles and lean operating models. Simultaneously, however, the 'instant gratification' trend has reduced the tolerance for business downtime, and customers expect to receive a continuous and reliable supply of products and services. Thus, the cost of downtime, tangible and intangible, has risen steeply over the years, and studies show, can reach up to $70 000 per hour for certain large organisations," she says. "As business continuity practitioners, we understand the need for organisations to respond rapidly and effectively to disruptive events. Consider the 9/11 incident; 40% of companies without a strong disaster recovery capability were out of business within six weeks. We therefore need to start using tools and technology available to accelerate response times and empower decision-makers." There are several ways in which technology may be leveraged to improve the implementation, monitoring and reporting of business continuity practices, from increasing the efficiency of roll-call during an evacuation, successfully managing perception during a crisis, through to ensuring business continuity plans are easily accessible at all times. Such progressions can prove to be life-saving and business-saving. In addition to opportunities that digital advances afford, we need to be cognisant of the increased pressures that organisations face. Regulations like the General Data Protection Regulations (GDPR) and the Protection of Personal Information Act (POPIA) make it increasingly important for organisations to protect personal information, and therefore having multiple paper copies of business continuity plans in team members' cars or homes is no longer a viable option for ensuring plans are available when needed. ContinuitySA has therefore been working on a mobile application for business continuity and resilience. A mobile application would offer myriad benefits to organisations, including easy, 24/7 access to response plans; improved protection of the data contained in plans; increased awareness regarding the plans and their contents, additional functionality that paper-based or PDF documents could never provide; and peace of mind, to name a few. "ContinuitySA prides itself on thought leadership in continuity and resilience, and responding to the emerging needs of our clients," she says. "We are extremely excited about our mobile application and the value that it will bring to our clients. 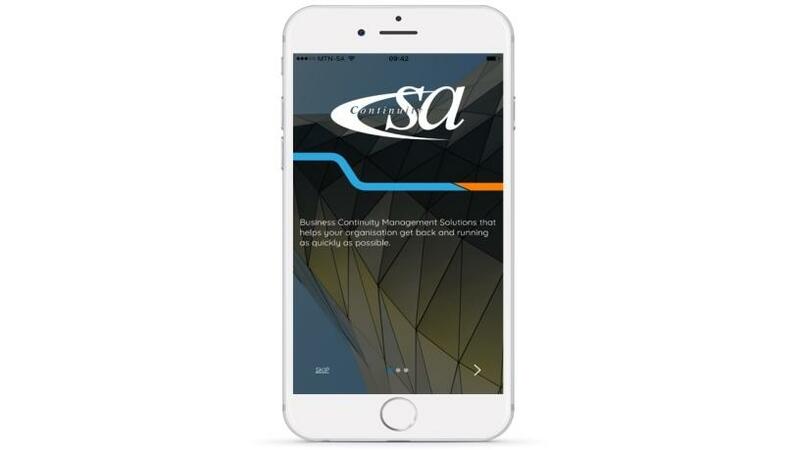 Watch this space as we prepare to go live, and launch the 'CSA BCR App' in the market..."
ContinuitySA is Africa's leading provider of business continuity management and resilience services to public and private organisations. Delivered by highly skilled experts, its fully managed services include ICT resilience, enterprise risk management, work area recovery and BCM advisory: all designed to enhance business resilience in an age of escalating threat. By helping clients understand their risk profile, and then develop an appropriate risk-mitigation strategy, ContinuitySA provides peace of mind for all stakeholders.